The web has been a standard platform for both consumer-facing and business-facing applications for more than 10 years. The enormous amount of open source projects, commercial tools, and frameworks make fast web development possible. Openbiz Cubi is a robust PHP application framework giving developers the ability to create business applications with minimal effort. In this two-part series I’ll explain the concepts and steps necessary to create your own business web applications with Cubi. We’ll look first at the challenges web developers face and how Openbiz Cubi can help, and then how to install Cubi. In part 2 we’ll see how to create our own modules. Even with many choices for a web development framework, application development is still a very challenging job. A good framework can help developers code with good programming practices such MVC and ORM, although to build a real world application we sometimes have to spend time writing code beyond the capability of the framework. Learn the framework and code with it. After creating a â€œHello Worldâ€� app with the framework, developers still have a steep learning curve to build the first prototyped application. Implement common features like user registration, login, password reset, etc. Provide permission control for users. Because of the complexity of generalizing access control, permission logic is often hardcoded in the software. All the above tasks are necessary but not the highlighted features of the application. Spending too much time on them brings frustration to both clients and the development team. An XML-based coding scheme. Developers use intuitive XML to describe the data objects, pages and forms, as well as user interaction. A modular platform that has many common component built-in. Developers make their own modules and load them in the platform. A default professional-looking UI with multi-theme support. Flexible permission control options, from simple to sophisticated. To learn more about Cubi, be sure to visit the project site code.google.com/openbiz-cubi and official website www.openbiz.me. 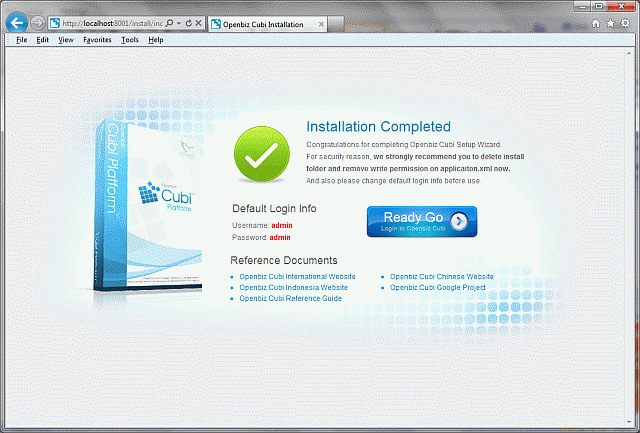 To install Openbiz Cubi, you need to download either the source code or Windows installer from code.google.com/p/openbiz-cubi/downloads/list, or you can get the latest source code from the Openbiz Cubi SVN server. Web server – Apache, IIS, etc. In your web server’s web directory, create a folder named cubi. Unzip the Cubi ZIP file to the directory (or check out the source from SVN under this directory). Installs Apache 2.4, PHP 5.4 and MySQL 5.3. After installation is completed, you can find Apache and MySQL in the System Services list. 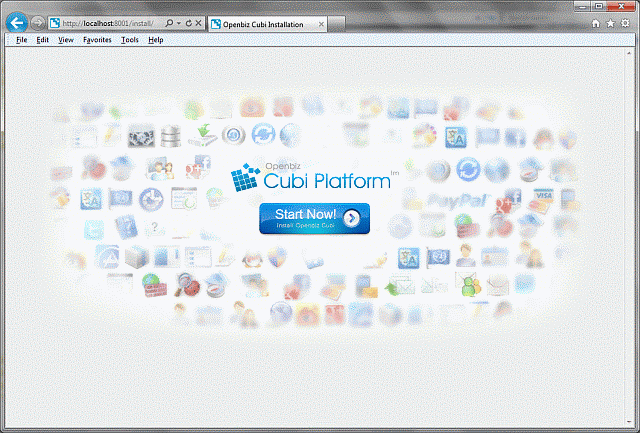 Installs the Openbiz Cubi platform and business applications. You can choose to unselect the options of installing business applications which are not released under open source. Adds desktop icons and start menu items. After the code is installed to the web server’s directory, you can launch Cubi’s web installation wizard in a browser to set up the database and load modules. Run the installation wizard by launchingÂ http://host/cubi/installÂ in your browser. Click the Start Now button and follow the steps until you see Installation Completed page. Then you’ll be ready to test drive Cubi. After you log in to Cubi as admin, you’ll see the Administration dashboard. You may see other tabs as well, like â€œContactsâ€� and â€œCalendarâ€�. System module – provides the ability for system administrators to manage users, roles, modules, groups and permissions. Menu module – provides support for page navigation by menus, tabs, and breadcumbs. User module – provides functions for users to register, sign in, and reset passwords. MyAccount module – provides My Account pages where a user can manage his own profile, preferences, activities, and password. Cubi comes with other modules such as Contact, Email, Event Log, Security, Theme, Translation, Attachment, Picture, Chart, Payment, OAuth, Web Service, and more. Header – this section contains the logo, My Account link, application tabs, and breadcrumb navigation. Left Menu – this section contains navigation menus and other widgets. 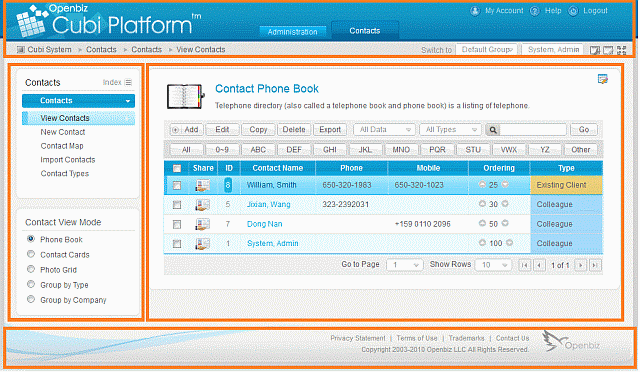 Content – this is the main area users will work in with their data and business logic. Footer – the footer may have links about the application provider, copyright, etc. For the application administrator, one of the most important tasks is to manage users and their permissions to access certain resources. Cubi supports several widely used access control models including Role-based access control (RBAC) and Group-based access control (similar to Unix file permissions). I’ll briefly discuss how to use RBAC. A Cubi user account is simply called â€œuserâ€�. A role usually means a type of user. Different roles are permitted to do different things. Cubi comes with three roles: administrator, member, and visitor. A user can be assigned to one or many roles. 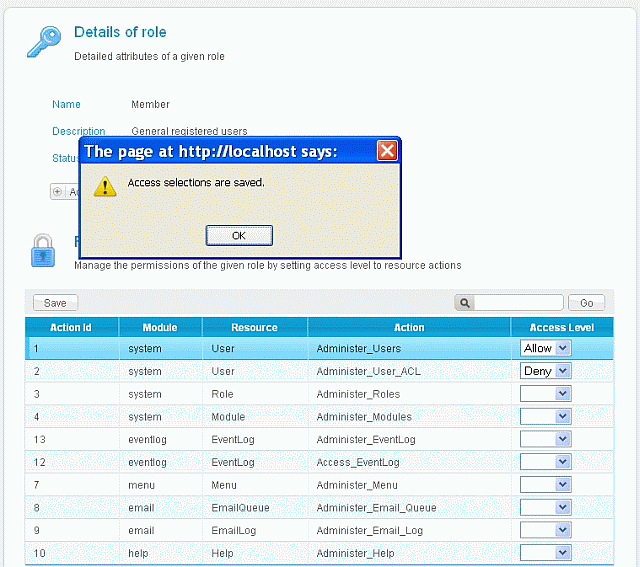 An administrator needs to use the Role Management page to allow or deny resources for a given role. When he wants to grant a user certain permissions, he associates the user to a new role that has those permissions. This is where I’ll end the first part of the series. So far we’ve talked about the challenges web developers face and how Openbiz Cubi can help, how to install Cubi, and undertook a brief overview of how Cubi is organized. In the next part I’ll dig deeper and show you how to create your own module. Stay tuned! Rocky Swen is the founder of the Openbiz Cubi open source project. He spent his career on cloud, mobile, video encoding and streaming, business intelligence and enterprise technologies. During weekends he enjoys hiking with his family and playing tennis with friends.